Different substances produce different effects, so you may not know which substance your loved one is using. While it may not be specific actions, you can just tell that something seems off. One drug may cause a person to be lethargic, while another causes manic excitement. Your loved one may not exhibit all of these signs, but you probably know him or her well enough to know that something is different. The time to encourage your loved one to seek treatment is now. The longer addiction continues, the more damage a person does to his mind and body. It can seem like recovery is an impossible feat, but with help, anyone can experience addiction recovery. Let your loved one know that you're there for him or her. Many people struggling with addiction feel alone. It's very comforting to them to have a support system. You might attend family therapy with them in a rehab facility, or you can simply let them know you'll do everything you can to encourage their sobriety once they're back home. You love them, but you don't have to accept their behavior or their addiction. Tell them you want them to seek treatment because you care. Located on San Juan Island, Washington, The Clearing sits on 64 secluded acres that are only accessible by ferry. We're just a few hours from Seattle, but in our remote locale, you or your loved one will be in the perfect substance-free environment that encourages healing. Our 28-day residential rehab program features the same amount of individual counseling you could get in two years, so you get a great deal of personal attention. Is addiction ruining your life? It doesn't have to be that way. 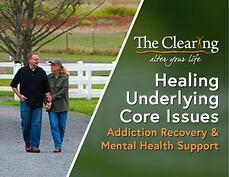 The Clearing is ready to help you on your road to recovery. Call us today at 425-275-8600.